Hello and Welcome to Shawn's Triops. The ultimate Triops site! I had always been interesded in Triops, but none of the science stores aroound my area carried them. So I finally ordered them oline from the Lonezone. They are amazing! On this site, there is a diary that I will update daily with the progress of my Triops. So far all is going well! I will provide lots of information on these unique little crustation, as well as pictures. 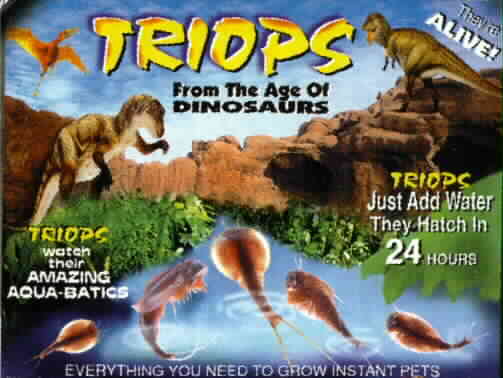 And maybe persuade you to get some Triops to experiance them for yourself! Interesded in Triops? This is the site for you! AAHHHH! Canabalism abounds! Uniprong and the smallest Triops have been eaten!!! !